It doesn't get any better than this. The Lyons is located on South Lumpkin Street, opposite Myers Hall & one of the major housing areas of The University Of Georgia. 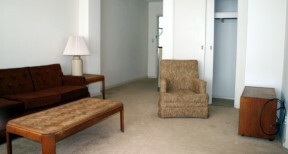 All apartments are carpeted and furnished. The Lyons is an eight-story building with elevator. It is composed of 36 efficiency apartments and 16 one bedroom apartments. 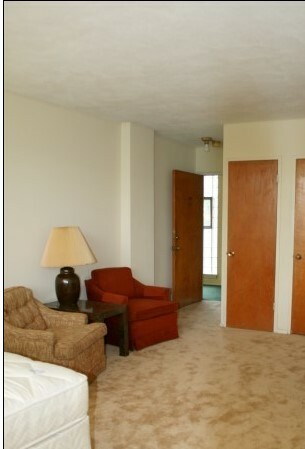 All apartments are carpeted and furnished. Our friendly, knowledgeable representatives are located in our lobby and are available to assist you. Our maintenance staff is on site and available to quickly resolve any issue you may encounter. The Lyons has three types of apartments. One bedroom corner apartments have living room with built in kitchenette, bedroom, and bath. Furnishings include sofa, twin/double beds, dinette table and chairs, chest and lamps. Lease required. Large efficiency Apartments have combination living and loft, separate dressing room, bath and kitchenette. Efficiencies are furnished with twin beds, chest of drawers, tables and chairs. Efficiency Apartments have combination living and bedroom, separate dressing room, bath and kitchenette. Efficiencies are furnished with twin beds, chest of drawers, tables and chairs. © Copyright MathisMgt.com. All Rights Reserved. Website by selectsolutions.us.